Meanwhile, in 12-inch skillet, heat oil over medium-high heat until hot. Add chicken; cook and stir 8 to 10 minutes or until no longer pink in center. Remove chicken from skillet; cover to keep warm. Reduce heat to medium. To same skillet, add zucchini, onion and garlic; cook and stir 4 to 5 minutes or until zucchini is crisp-tender. Add cooked chicken and Alfredo sauce; mix well. Place half of mixture (about 2 1/4 cups) in storage container with lid; cover and label "for Cheesy Chicken Alfredo Pizza". Refrigerate up to 2 days. To remaining mixture in skillet, add cooked rotini and pimientos; cook and stir just until hot (do not boil). Sprinkle with Parmesan cheese and parsley. 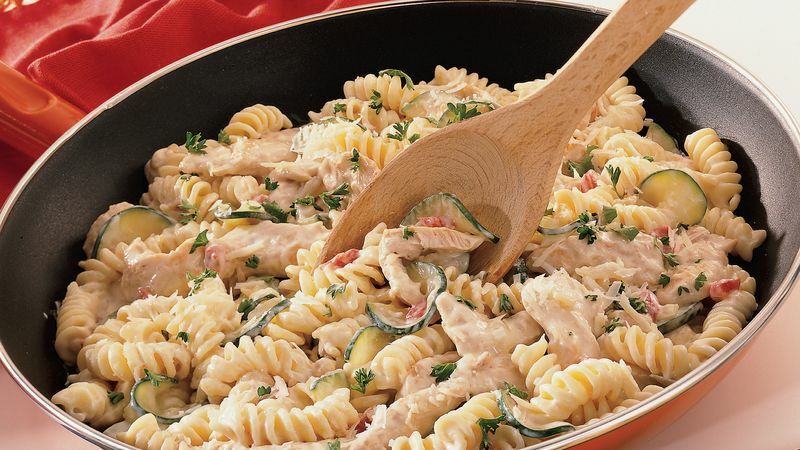 Serve the family chicken pizza tomorrow night, and they won't know you got a head start with tonight's skillet dinner. What a great way to disguise those planned leftovers! Purchase 2 lb chicken already cut for stir-frying, if it is on sale or if you prefer to save preparation time. Use any short pasta that is in your pantry that is the same size as rotini, such as fusilli, penne, mafalda (mini-lasagna noodles) or elbow macaroni.